The Rapide Project was the incubator for CEP. Rapide is an event driven system simulation language and analysis toolset developed under DARPA funding from 1989 – 2000. It involved a collaboration between the Stanford Rapide research group led by David Luckham and an R&D group at TRW Inc. led by Frank Belz. 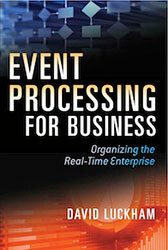 The primary concepts involved the use of events, complex event patterns, event processing agents (EPAs) and dynamic architectures of EPAs to model dynamic, hierachical systems. Both hardware designs and software systems were modelled, including avionics, Command and Control systems, chip fablines, stockmarket trading, telco protocols, etc. The Rapide system has been freely available since 1993 and has been downloaded by hundreds of research groups and university projects worldwide. It was used by NIST to prototype proposed standards for Event Driven Architectures for industrial automation. Rapide is still in use in the USA and Europe for similar studies today. There are many publications from 1992 through to today by Stanford, TRW and many other groups using Rapide. Further information and the Rapide group membership can be found on the Rapide website.